The American culture of death changed radically in the 1970s. For terminal illnesses, hidden decisions by physicians were rejected in favor of rational self-control by patients asserting their "right to die"—initially by refusing medical treatment and more recently by physician-assisted suicide. This new claim rested on two seemingly irrefutable propositions: first, that death can be a positive good for individuals whose suffering has become intolerable; and second, that death is an inevitable and therefore morally neutral biological event. Death Is That Man Taking Names suggests, however, that a contrary attitude persists in our culture—that death is inherently evil, not just in practical but also in moral terms. The new ethos of rational self-control cannot refute but can only unsuccessfully try to suppress this contrary attitude. The inevitable failure of this suppressive effort provokes ambivalence and clouds rational judgment in many people's minds and paradoxically leads to inflictions of terrible suffering on terminally ill people. Judicial reforms in the 1970s of abortion and capital punishment were driven by similarly high valuations of rationality and public decision-making—rejecting physician control over abortion in favor of individual self-control by pregnant women and subjecting unsupervised jury decisions for capital punishment to supposed rationally guided supervision by judges. These reforms also attempt to suppress persistently ambivalent attitudes toward death, and are therefore prone to inflicting unjustified suffering on pregnant women and death-sentenced prisoners. 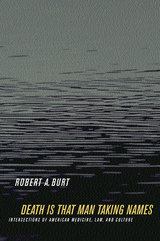 In this profound and subtle account of psychological and social forces underlying American cultural attitudes toward death, Robert A. Burt maintains that unacknowledged ambivalence is likely to undermine the beneficent goals of post-1970s reforms and harm the very people these changes were intended to help. Robert A. Burt is Alexander M. Bickel Professor of Law at Yale University. He is the author of The Constitution in Conflict (1992), Two Jewish Justices: Outcasts in the Promised Land (California, 1981), and Taking Care of Strangers: The Rule of Law in Doctor-Patient Relations (1979).